On his way to a 2 week break in the sun, my colleague came across the Gloucester Services situated on the M5 Northbound (he's forever working) which had a very special local community feel to it. Service stations across the UK usually only host your household chain names. However, Gloucester Services have completely stepped away from that, introducing a service station that is dedicated to local suppliers, farming and the local community. Of the 200 produce suppliers, 130 are within a 30 mile radius of the ground-breaking service station. Upon entry, you will be greeted by two mammoth ash tree trunks (cut from the nearby Forest of Dean) which are suspended above the entrance to the services. Grass covers the roof, coinciding perfectly with the back drop of the Gloucestershire countryside. Once in the main building you will be welcomed by an expansive food hall, continuing with the local produce theme. 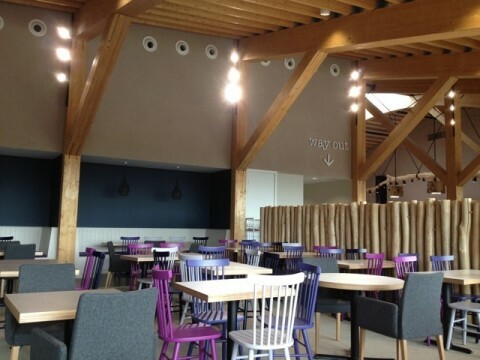 Not only is the food impressive, the internal design maintains the Gloucester Services already flawless image. The rear of the café area contains eating booths, which resemble beach huts (roof and all). The booths provide a solitary eating area, something that I personally have never come across. The largest area of the food court combines classic and modern style café chairs, using humble yet effective colours creating a contemporary look throughout. Not only will the estimated 4 million visitors a year reap the benefits of the new services. A charitable trust serving Podsmead, Matson, White City, Quedgeley, Tuffley and Stonehouse will benefit to the sum of 10 million pounds over the next 20 years. Furthermore, a proportion of profits from the business will be put back into the local community. What a fantastic concept this is! Not only does the business use all local produce it also gives back to the community, in my eyes it is the perfect combination. If you are heading northbound past the Gloucester Services be sure to call in and check out this which is sure to be a highly popular establishment. Better still, work has begun on the southbound service station, scheduled to open in May 2015.